It’s been a semi-steamy week here in Thailand. Overall the weather has been just great. Cool mornings. And while many days still find the 90s (F) the coolness of the morning sets the whole day in better place. It feels like there is alot going on my life lately… with the big “end of the year” ball rolling at work and with my time in Chiang Mai. With our school year ending in a matter of weeks, the new school year starting the beginning of May, and changed Visa policies making it more challenging for teachers to get Visas, my employer has already hired teachers for the new year. On more than one occasion I’ve met the “new faces” getting a tour of our office space, including my replacement. Just another stark reminder…as I have chosen to leave after this school year… that the end is coming. Even though I have been traveling for 5 years now, with heaping servings of uncertainty along the way, transitions are always difficult for me. 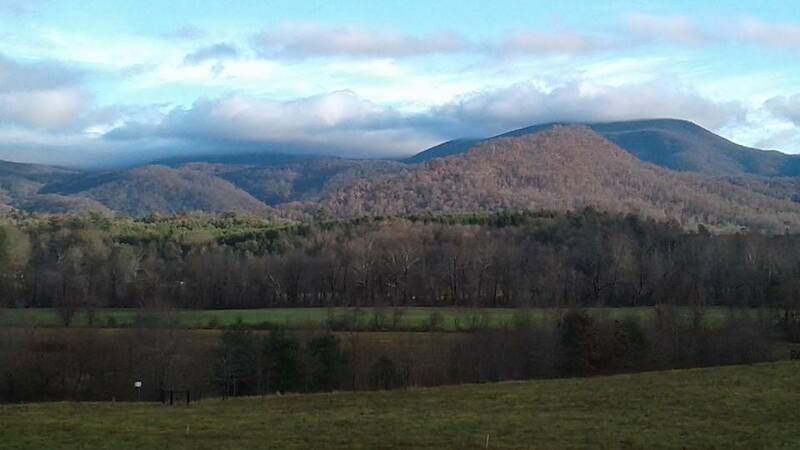 I am clear it is time for me to leave, but there is always some apprehension as I depart circumstances that in many ways have been “home” with more uncertainty waiting on the other side. It often moves my mind and body into a tailspin. But, just the same, it also fun and exciting to wrap-up one place and head in a new direction. In some ways things are a bit smoother at work. Our big English Fair is complete which had our lunch and class times bustling with singing and dance rehearsal. Although I tried to be light about the whole “dance performance” thing, at a school that takes singing, dancing and performing fairly seriously – it was at least a little bit of a big deal. It was Friday night when the fair was held and all the classes took their turns performing on the big stage – professional lights, sound and all. My students’ first dress rehearsal was – a little rough. But after a few more last-minute rigorous practices, they did a great job! It’s amazing how them getting on stage made me more nervous than being on stage myself. During the performance where was I? I was the geeky teacher to the side of the stage meticulously mouthing all the words and doing the dance moves. When they were finished it was big relief and fun to share that moment of happiness and success with the students. Some completions here in Thailand are already coming to be. I taught my last “2-skills” class last week. At my school our classes are divided up between “4-skills” classes that we see every day and “2-skills” (speaking and listening) that we see just twice a week. I have 6 “2-skills” classes – so a total of twelve a week. 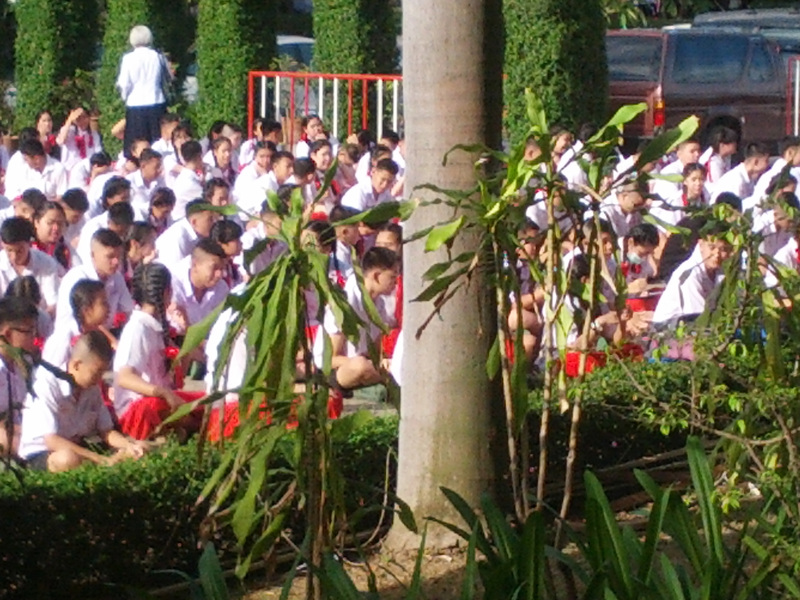 These classes are larger (about 44 students or so) and fold into the regular English lessons taught by a Thai teacher. While all my students are great, happy bundles of energy- collectively they will give you a run for your money. In some ways these classes are fun because they are less serious, more light-hearted. Lessons are generally simple and taught in a way that is fun and easy to digest. The challenges come with the sheer number of students in the classroom and the low-level of English comprehension. So, while the students may like you, they don’t understand most of what you have to say – and perhaps some “selective hearing” too. At any rate, the “2-skills” classes were both my joy and challenge this year with a great big dose of enthusiasm and energy (not necessarily directed towards me or learning) that was sometimes fun and at other times hard to digest. Of course finishing anything is bittersweet… it is still “something” to be complete with the lessons on that journey. However, the year isn’t complete yet. We still have individual speaking tests to complete (over 230 students for me total! ), reviews and final tests to go and then a few weeks of teacher wrap-up. In all honesty, while there are many things I have appreciated about my time in Thailand, there have also been a number of things that have been challenging. A few weeks ago I had a spontaneous “heart-to-heart” with one my supervisors. What unfolded was my clarity of how rich this time has been for me. I could feel the bounty and how much I have changed shape, grown and expanded from living and teaching here and riding the huge wave that is this bustling respected local Thai school. And for that, I am so grateful. And with that I will say good-bye for now. Back to tending to my post-work haze – doing my best to glide comfortably in the current of my latest transition. How are things in your world? It’s always good to hear from you! -Featured image above, bridge construction “Thai-style” over the great Ping River. Well, it happened. The first week of classes has come… and gone. While many teachers around the world are getting ready for their summer break, here in Thailand we are just getting started. I am teaching English at a LARGE (6,000 plus students) elementary, middle and high school in Chiang Mai, Thailand. As part of their Native English teaching program, I teach an assortment of classes, primarily 4th grade with some 6th, to a mostly attentive group of 30 – 40+ students per class. While many of the classrooms where I teach have no air conditioning and the weather here is a bit… warm… just the same I am doing alright! I am surprised here in a sea of Thai faces how smooth everything seems to run. The students, for the most part, seem to know what they need to do and do their own thing. And while kids will be kids anywhere in the world, generally there seems to be a good bunch here. A snapshot of the scene while doing a little shopping in busy Chiang Mai. I am learning a bit more about the ins and outs of Thai culture as I continue to weave my way into life and work. I have learned for example that hardly anything is “set in stone”. What may cost one person 200 baht can cost the next person 300, or even 150 if you are willing to negotiate. While there is a conservative bend in Northern Thailand, there is still an inescapable sense of something like freedom that permeates the scene. Even here at school, I was surprised to see when class is out, there is no teacher who stays and monitors the students. They are left there on their own. When the teacher leaves, they do go a little bit wild in an innocent childlike sort of way but also make their way to lunch and recess so far without little to no drama. One class I peeked in on at the end of the day was like a busy group of elves, sweeping the floors and putting away desks. You can’t escape the incredible sense of service that is here in Chiang Mai and I imagine throughout Thailand. At first it was a little off-putting when I went to the store to see a friendly Thai face standing right there ready to be of assistance. I have to admit I tried once or twice to throw them off my trail, hiding below the shelves in my independent American way. But in the end, I surrendered. I let them carry my purchase. I let them show me the matching sheet set. Once there was even a second sales assistant who showed up bright-eyed and smiling with a cart for the convenient carrying of my possible purchase. This same sense of service can be seen here in the classroom. I have one class where at the end the boys race to the desk to see who gets to carry my things back to the classroom. It is really adorable. I walk back to the office sometimes with as many as three loyal helpers dutifully carrying my excess things. My adaptation is not without frustrations of course, the challenge sometimes found in doing the simplest of things in a foreign land. But overall this transition is ushered in with a good feeling. I am at home now for the evening after a productive but sweaty afternoon. It is nearly 6:30pm and the outdoor orchestra has begun with the wide assortment of crazy noise-making insects and birds. Soon, week two of teaching will commence. 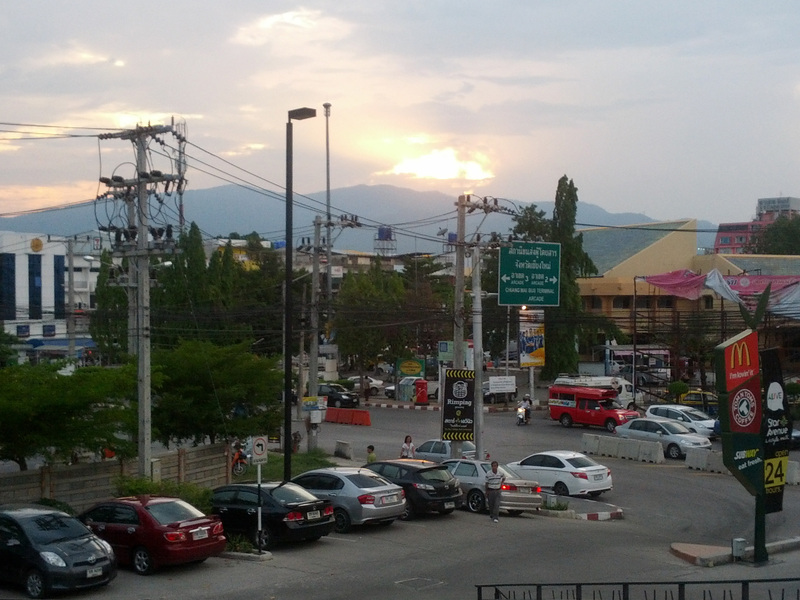 Good-bye for now from Chiang Mai, a place so far of new beginnings, mild adventures and entertaining adjustments. Happy almost Christmas from South Korea! It is already Sunday here. Today is the last day of my weekend before returning to work for a full week on Monday. While Christmas is celebrated here, it seems to be a rather informal holiday. I am told it is not a big family celebration like it is in the States but more of a special night out. So, alas I will be working on Christmas eve and Christmas day. It will still be a few days of rest in some capacity as there are no school groups scheduled on those days and there are no classes to teach. My first week of work and classes overall has been very positive. I will receive two weeks of training here at the English Village in Paju, South Korea before I am “let loose” on my own. My task this week was to follow and watch other teachers teach. A good way to ease into my new job and role as teacher. I saw a lot of good teachers and got a feel for the style and way of teaching here. I also got a dose of the sometimes needed discipline in the classroom and good strategies to re-establish order and generally maintain the classroom rules. This coming week while I will still be in training I will start contributing to teaching the lesson plan. Admittedly I am a little anxious about being in front of the class and teaching… but also excited about it. Another teacher here encourages me that you just need to get up there and do it. And, while I am nervous to do it, I agree. This weekend has been mostly quiet for me. It began with a little trivia game/party Friday night at the English Village pub with other teachers. Christmas trivia was the theme. The rest of the weekend for me has been time to relax and continue to settle into my new country and place of residence… caring for the simple things like filling my kitchen with good healthy food. I had to smile when on Saturday I left my apartment in the English Village and was suddenly surrounded by a half-dozen smiling and giggling Korean girls about 9 or 10 years old. Apparently they were on a scavenger hunt of some sort and I guess when they say me they found what they were looking for. Enthusiastically they asked me what my name was and had me sign their worksheet. It was cute. I imagine today will be another easy day for me. Tomorrow night there is a potluck holiday celebration for staff here on campus. It will be nice to continue to get to know the other teachers and staff living here at English Village. So, here I am… one week in South Korea! I am grateful to be here! I am also grateful to the friends and supporters who have contributed to my Indiegogo campaign “Gypsy Woman Goes to South Korea.” The support I have received so far makes a big difference to me personally and professionally as I transition to my life here in South Korea. Thank you! Thank you! My Indiegogo Campaign comes to a close on December 24 at midnight PCT. Will you support my campaign? Any contribution, no matter how big or small, makes a BIG DIFFERENCE! Click here to check it out and watch my video www.indiegogo.com/southkorea. Thanks so much! From the chilly and snow dusted land of South Korea, I wish you all a Merry Christmas and Happy Holiday! Thinking of all of you wherever you are and wishing your warmth and cheer! A funny thing happened on the way to Korea…. Greetings from the “midpoint” of my journey to South Korea! After spending a few days with my family in the mid-west, I left in the wee hours this morning for Korea. With over 19 hours total travel time, I knew I was in for a big day! My mom, who is always there for me, got up this morning at 3:30am and made me scrambled eggs for my trip. By 4am we were out the door and on the one-hour trek to the local airport. We arrived with great ease and found our way to the gate. There was a small delay entering through security as an alarm was going off. The security guard, with his laid back mid-western fashion, joked, “maybe it means that the bacon is ready!” Eventually, it stopped and we were allowed to proceed. All seemed well as I waited to depart for my 6:10 am flight traveling to Denver then connecting to San Fransisco and then the long flight to Seoul Korea. It was about a half hour before my flight was to leave when the “on time” status came off the flight board. There would be a delay. There was a plane maintenance issue and we would have to wait for a new airplane. Eventually we loaded onto a new airplane and in one hour and 40 minutes we were landing in Denver. My flight and several other passengers’ connections were very tight and so they allowed us to deplane before the others. Moving as quickly as I could down the long corridor to my next flight I arrived at my gate only to find it abandoned and desolate. No sign of life anywhere. It appeared they departed… and quickly leaving no sign that they were ever there. I was rerouted to a later flight to San Fransisco and also changed to a different airline for my flight to Korea as I would miss my connection in San Francisco. That’s okay, I thought. Doing my best to “go with the flow” while also doing my best to keep track of my checked-in luggage looking out for it in a manner somewhere between a pit bull and a protective mother. Then arrival in San Francisco. Next? Head to the ticketing agent of my new airline to get a boarding pass. It turned out that their flight was full and there was no room for me… or the Korean man also rerouted making his way to Seoul via St. Louis, Missouri. We were directed back to the ticket counter of our original airline, United Airlines. There we met a very friendly staff member willing to take his time to help us and go out of his way to make sure that all was well. His first suggestion? Rerouting our flight through Shanghai arriving in Korea around midnight on Wednesday Korean time. Hmmm… I don’t think that is my flight! “What about tomorrow?” I asked… can’t we just stay the night and take the same flight out tomorrow? He was quickly agreeable offering ways to cover additional expenses… giving us complimentary meals tickets for lunch dinner and breakfast tomorrow. And while he couldn’t pay for the hotel upfront, he hooked us up with a discounted hotel rate with promises of getting reimbursed by the airline. So I took it! And here I sit… quite content… at a pink Spanish style chain hotel just a stone’s throw from the San Fransisco airport. I have Internet, a big cumfy bed. In truth I am grateful for an afternoon break and a good night’s sleep before my 12 hour flight to South Korea! So here I am! I am on my way… and content to be delayed until… my late morning flight tomorrow. Tonight is sure to include a relaxing evening in the comfort of a quiet hotel room, a good night sleep… and tomorrow…once again…on my way to South Korea! My Indiegogo campaign, “Gypsy Woman Goes to South Korea, ” is still going strong. I invite you to visit the campaign and watch a brief video about my journey at www.indiegogo.com/southkorea. And while you’re there, if you’re inspired to make a donation, that would make a world of difference to this Gypsy Woman! Thanks for stopping by! And as always feel free to write and connect. I’d love to hear from you! Don’t be fooled by the photo above. It’s not the Golden Gate Bridge! Alas, it is the view from the San Fransisco Airport while waiting for my hotel courtesy van pick-up! I am in that busy hazy phase prior to making a life-altering shift. You know the one, where you tend to the immediate details at hand preparing you for something that… hasn’t fully consciously hit you yet. Yep, that’s me. Although it’s starting to hit me… waves of excitement and anxiety are finding their way to my body. I wake up before the sun rises, before the busy little bodies in the home where I stay rise. I get up and I start to work… on whatever I can think of to do next to make sure I have everything cared for before I leave. Bye the way, did I mention that I am leaving on Tuesday? As in less than a week from today? I was patiently riding on the slow visa train to Korea when all of a sudden, I switched tracks and landed on the express. And here I am wandering in everything I want to make sure is complete and wondering about the little things I am not thinking about that still need to get done. Last week it suddenly dawned on me… that I needed to buy a plane ticket. I felt sort of like an expectant mother who had gotten so comfortable in the process of pregnancy that I almost forgot about giving birth. And then one day, the alarms sounded… it is time! It is time NOW! So here I am bustling in the wake and energy of my plane ticket purchase preparing for my imminent trip to Korea. My new place of employment, the Gyeonggi English Village (GEV), is ready for me to arrive and to begin training for their new program. I will be teaching English at a hands-on-learning campus created to immerse Korean and international students in the English Language. Happily I will be making a brief stop in the mid-west to visit with my family – my parents and my sister and her family. My gut says its important to spend some time with them before I leave, even for just a few days. I will leave for Korea from there. This is not something that happens for me every day – preparing to travel to Asia! It’s my first time there. I am grateful for a few little tokens of comfort like knowing that I will be picked up at the Seoul airport by a taxi driver sent just for me who will be holding a sign with my name on it. It’s funny I have always seen that scene played out in the movies, but it has never happened in my own life… until now. I get butterflies in my stomach just thinking about it! From there I will be taken to my apartment on the GEV campus. Yes, my own apartment – a luxury that I have not had the pleasure of since I have been traveling. I am wrapping up my time here at the family residence in Philadelphia that I have called “home” for the past 3 months. The youngest boy has been feeding me a steady diet of hand-made presents, since I won’t be here for Christmas. Practically speaking, this home has been a perfect place for me to be at this time of transition and visa making. I have been just a stones throw away from the post office, UPS office and other “city needs”. Additionally I have been most fortunate to have use of a happy, thriving, macintosh laptop computer. It’s a lovely toy, if even for the short-term, and especially with the expected death of my slow but well-loved PC laptop… hanging in there for now, but… it doesn’t look good. I am trying to make the most of these last few days here… preparing the family as best as I can to transition to life without an extra set of hands. I did my best to stock up on groceries and even cooked a few casseroles to put in the freezer for a little added comfort and joy when I leave. And now, well, I keep walking the walk of “what is there for me to do next?” on my road to South Korea… getting shorter and shorter as the days go by. A busy and expectant time! If you’d like to learn a bit more about my journey and trip to Korea, I invite you to view the video I created. It’s on my Indiegogo campaign at www.indiegogo.com/southkorea. And while you’re there please consider a contribution of any amount to support the continuation of this long lovely journey and big school of life. Thanks for joining me from time to time on the road. Much more to come! Photo of Forbidden Road, my favorite “getaway” in near-bye Wissahickon Park in Philadelphia, PA.
Well the time has come… I just can’t keep it a secret anymore! I am ready to share the NEXT BIG STEP on my journey. After taking the leap and buying a ticket to Europe over a year and half ago and recently returning to the States for a few months of preparation, it is nearing time for me to depart on my next adventure. Where am I heading you ask? Well…I will be traveling to South Korea to live and work for a year teaching English as a Second Language! Here is how this NEXT BIG STEP came to be. While traveling in Europe, as I am sure you can imagine, I was always open to, looking for and wondering how I could earn some income to support myself as I travel. I lived very modestly and simply but as time went on I was nearing the edge of my finances. I needed to find a way to earn money and travel. It was suggested I look into teaching English as a Second Language (ESL). I explored this in a light and curious way about 6 months into my journey. I searched online for jobs and schools. I read blogs of others who had traveled and done the same. I met other travelers who were preparing for jobs teaching English. My initial investigation was into jobs teaching English in Europe. My inherent enthusiasm began to dwindle as I knocked on virtual door after door only to hear repeatedly that if I was not a citizen of the EU or did not have a permit to work in the EU, I would not be considered for a job. This seemed like a catch 22 as the only way I knew for an American to get a work visa in Europe was to be sponsored by a company. Alas, and so it goes… I was sure there were Americans teaching English in Europe and that somewhere there were indeed jobs to be found, but how or where to find them was a mystery to me. The next question that arose was certification. I have a Master’s Degree in Education specializing in Higher Education, but with no experience teaching ESL. I wondered if I needed to get a certification in TEFL (Teaching English as a Foreign Language) or TESOL (Teaching English to Speakers of Other Languages). The programs vary widely from quickie on-line courses to in-depth courses where you get your certification on-location. The better courses come with a price tag which didn’t help my initial call which was – replenish the well and earn some income. Unsure of where this would lead, I did my best to take in information and stay open to new possibilities. Later into my journey a trusted friend urged me to more seriously consider teaching ESL. At this point it seemed pretty unlikely that I would get a job teaching English in Europe, especially without a TEFL or TESOL certificate, so I expanded my outlook and began looking into teaching in other countries. When I opened the ESL door wide open I started reading about and looking into the best places to teach English for Americans. There are many countries that easily welcome Americans to teach English and many are willing to hire you without a TEFL or TESOL certificate. Still I wanted to be mindful as I was seeking a quality experience. I was referred to a website called Dave’s ESL Cafe by a fellow traveler. This site lists jobs teaching English in Korea, Thailand, Japan, and all over the world and is well-known in the ESL community. I found it to be a simple and straightforward website with plenty of job listings primarily in Asian countries. I scanned through them regularly, curious and yet nervous about working and teaching English. One day I found a job listing that peaked my interest. It wasn’t a typical teaching job, but in a learning environment created to be like an English Village. Children came to the Village for a week-long experience in speaking English. Teachers were more like facilitators and learning was active and hands on. With my background as a leader in experiential education and creating workshops where students learn by doing, the seemed it may be up my alley. The job was in Paju City, South Korea, about an hour outside of Seoul. I was interested, but I ignored it at first and continued on with my day. Later that night as I was going to bed, my intuition whispered to me “take a leap!” and apply for the job at the English Village in South Korea. So, excited but nervous I submitted my resume. Time passed by and I heard nothing… but still in the back of my mind I had a “feeling” that something may come of it. Then one day, just a few weeks before my time commitment was to end at my helpx exchange in France, I got an email from the English Village in Korea asking if I was still interested in a position. Yes! Yes I was interested! I was scheduled for a Skype interview at 4:00 in the morning my time…ugh… All went well and I was offered the position. That was the beginning of a long process in preparing to work and teach in South Korea. This news changed my travel plans and redirected me to the States. The process of obtaining all the documents needed for a work visa would be much easier in the US. Presently, about three months into the process of obtaining a visa… I am getting closer and nearing the final steps. Yippee! And Oh my God!…. I am really looking forward to being in a learning environment again and strengthening some teaching muscles I have not used in a bit. I am also grateful to begin a travel opportunity that will support my financial needs. In the meantime… there is a bit of a financial gap… between now and when I receive my first paycheck. My staff contact in Korea reminded me recently that I won’t actually receive a paycheck until I have been there for a month. With my extended time in the States preparing my visa and the continued gap of working in exchange for room and board and no income, I have some unmet financial needs. This is what inspired me to … TAKE A LEAP…. and create a campaign on Indiegogo, the on-line fundraising resource, to raise funds to support myself during this time of transition and the continuation of my journey. Please visit my Indiegogo campaign. Preparing this campaign has been fun and inspiring. I have invested some time and created a video/slide show presentation called “Gypsy Woman: an unexpected journey”. I would love for you to check it out. If you’re inspired… make a little donation. No amount is too small… really…or too large. I am excited to share my story and my journey with you through this campaign. Also… if you’re inspired… please share my campaign with others… maybe someone you know who might enjoy my story and mission. And for now… the path continues. I am not sure of the exact date of my departure to South Korea as the visa process seems to have a mind of its own. But likely I am about 4 weeks away from leaving for South Korea. Wow…my next big step! Photo of Gyeonggi English Village in Paju City, South Korea.